In this case the plaintiffs were Messrs. Manning and Son, the well known purveyors of Barnstaple; and the defendant, Mr Wm. Corney, a respectable yeoman of Heanton Punchardon. The original form of action was a claim for £10 14s 6d preferred by the plaintiffs for value received; defendant acknowledged the claim and pleaded a set-off of £10 4s 2d, the value of a pig supplied to Messrs. Manning for the Christmas market – the balance had been paid into Court. Mr John Manning who deposed: - I am a butcher and in partnership with my father. About six weeks before Christmas last Mr Corney came to our shop and said he had a pig for sale, fit for the Christmas market, and asked if we would have it. I agreed to take it at the “times' price,” which was about 8s 6d. per score. He called on the following Friday and said his wife wished to retain half of the pig. I said I was glad of it; I did not care to have a large pig; but he must keep the head. He agreed to do so – said an additional cheek of pork would not be much in his house. A fortnight after defendant called again and said his wife had altered her mind and did not wish to keep any part of the pig. I said I had only bought half and would have no more. Some conversation took place as to when it should be slaughtered; and I said it was necessary that it was well done, as it was a show pig, and that I should send down Westacott, an experienced pig killer at my own cost to do the work. Plaintiff said he could kill a pig as well as any butcher in Barnstaple. I gave direction as to the weather in which he should kill it: if open and cold weather, he was to kill it on the Tuesday; but if it was close and muggy weather, on the Monday, that it might have more time to settle. On 23rd December the carcase was brought in; it was 22 score and 12lb weight. I did not inspect the interior and saw nothing disagreeable in it, though it had not settled well. The weather was close. When he brought in the pig I asked when he would take home his half. I said I had agreed for half and would take no more. I cut off a leg as the pig lay; it was 35lb. In the evening at 9 o'clock, I cut off the head where it lay. I immediately perceived a strong smell, - and on examination found the membrane of the gullet had been left in the neck. The smell was very disagreeable. I cut out a pound or two of putrid meat and coagulated blood. Everything should be cut out, that air may pass freely between the shoulders. The lard had not been touched or dressed, as it should have been. The half carcase was taken to our slaughter-house for Mr Corney. Cross-examined by Mr Bencroft: - I first engaged to take the whole pig, but a week after Mr Corney said his mistress wished to have half. When she altered her mind I refused to have more than the half I had engaged to take. Re-examined:- It is usual in exhibiting show pigs to lay them out whole. Mr Benjamin Manning, sworn: I am father and partner of the last witness. On 23rd December, in the morning, I saw the pig in question had been brought in, the carcase was lying on the stall. At Christmas carcases are commonly exhibited with the backs uppermost – this was on a cold slab, not a board. I put my hand to the meat several times during the day; it felt soft. At 9 o'clock in the evening I again went to the shop and my attention was called to the head of the pig, which had been cut off. It smelt very bad indeed. The next morning, at between 8 and 9, I went to examine it – I found half of it hung up and the head laid on a board by the side. I saw that it had been slaughtered by an inexperienced person: the lard was not lifted from the ribs and pinned out, with holes cut for the air to enter. But the moment I looked to the neck I saw that for a foot in length from the part where the head had been cut off, it was quite green. In killing a pig it is essential to take out the gullet and the loose particles and open the mouth with a skewer, and allow the blood to drain off and a current of air to pass through. I saw from the appearance that it was bad job and went to see the defendant at ten in the morning when he came into town. I said “William you had better go and see John: there is something the matter – the pig is bad – very bad.” He did not come, and I went to see him again, and left word with his wife to desire him to come. He did not come till 2 in the afternoon; when he came to my house in Joy Street. I said, “You've seen the pig.” He said he had. I said, “Well it's very bad; you had better take it home and do what you can with it.” He refused and became abusive and I ordered him out of the shop. I threatened to call the attention of the Searcher of the Market to it. I did not do so, as I thought he would think better of it and take it away. Cross examined:- If the pig had been properly butchered it would have been good, not only on that day but the two succeeding. William Day and Robert Cawsey, assistant to Messrs. Manning, gave corroborative evidence. The latter said Mr John Manning took out from 1 1lb to 1 1/4lb of clotted blood, &c, from the gullet of the pig. Mr Wm Balsdon of Westcott, was present when the pig was bought. Heard Mr J. Manning ask Mr Corney when he would take his half of the pig. Mr Manning said he should not have bought it at all , if Mr Corney had not engaged to take half. Mr G. Smyth, yeoman, saw the pig at 2p,m., on the 24th; it was green and very bad at the neck. Mr Bencraft addressed the Court for the defense, and called in evidence. 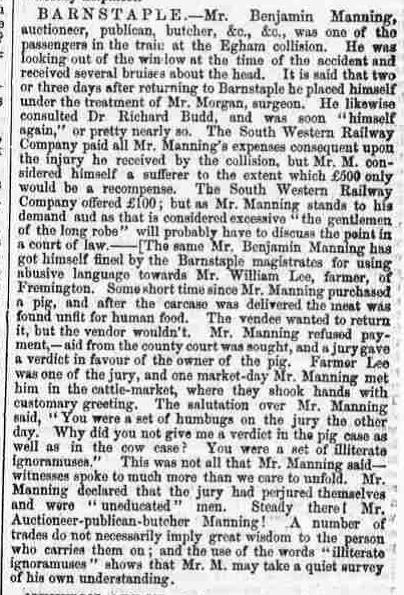 Mr William Corney, who deposed:- I sold the pig in question to Mr John Manning, who agreed to give the best price given in market. Afterwards I thought of keeping part and told him so; to which he agreed. A week after I called in and said I would not have any. He said,”I never said you should have it.” He offered to send a person to slaughter it. To which I said, “You can please yourself. I have killed pigs for you before, and can kill that.” It was properly slaughtered by Mr Stump and cleaned out, and an air passage left through the throat. When delivered, Mr John Manning said to me “You'll have half of this pig?” I said “Not likely; - you've got it and must sell it. I have nothing to do with it.” John ordered me out of the shop. There was meat sent to my cart the same evening. I left it at the quarters. Cross examined: - It is now salted; not by my orders. It was perfectly sweet on the night of the 24th. I smelled to it. I repeat that I never saw Mr Manning on the morning of the 24th. Defendant;- I might have seen him pass. Mr Crosse (to defendant):- I'll ask you no other question. Mr Henry Hoskings assisted to load the pig on the 23rd. It looked good. The portion I have tried today is sweet. Cross-examined:- I have tried the hams and some of the bacon; it is good. I saw the pig slaughtered; it bled well. Mr S. Stump, gamekeeper to William Williams, Esq, slaughtered the pig on the Monday before Christmas day. I have slaughtered many. I don't know whether the gullet was taken out; I did not dress it. Mr Berry dressed it. I saw it the next day, and it looked white and nice. Mrs Susan Pyke sworn:- I keep “The Green Dragon” Inn, Barnstaple. At six o'clock on the evening of the 24th December, a quantity of pork was brought by Mr Manning's people, and loaded into Mr Corney's cart. He had it taken out again and it was lodged in a room in my house. It was very good, except the head and part of the neck, and even that is good for food. I salted the pig on the 26th; it was then very good, and it is so now. Scores have seen it. William Westcott, butcher, sworn;- I have killed some hundreds of pigs. I saw the pig in question when exposed on Mr Manning's stall. It was well put out of hand, and cleaned as well as I could clean it. It was placed on its belly, which is not a good way to keep meat sweet, as it has no air. I cut up the meat on the Saturday, before salting it; it was good, except a few parts referred to, and even those parts are no good. Cross-examined:- I did not see the inside of the pig when it lay on the stall. I consider the gas burners and sausages around it had an injurious effect on the meat. Mr John Baker of “The Mermaid” saw the meat on the evening of the 24th December. It was very good and he offered to buy it. Mr Bencraft summed up, and Mr Crosse addressed the Jury. The Judge recapitulated the leading points of the evidence and the Jury returned a verdict for the defendant, stated that they considered that after Mr Manning received the pig, he was answerable for it. (the first part is about a train colision, but the second part deals with Mr Manning's altercation with a juror).